Schedule is subect to change. Times are in Eastern Standard Time (EST) except where noted. The King himself, King of the Park's, King Busch comes at you with everything in the arsenal from reggae, dancehall, punta, soca and anything else he feels is going to rock your world! There's no telling what's in store when the King is in the house. Long live King Busch, LIVE only on CRUFFYcast.com! TAGG International, I said TAGG International with Special and Jago are in full effect each weekday afternoon. They've got all the new musical flavor for your ear as well as the inside scoop on what's happening in the entertainment industry in Belize. Special has been rocking clubs worldwide for years, from the Big Apple to Hollywood, Chi Town to South Beach and now he's rocking CRUFFYcast every afternoon LIVE! Two dripping hours of soulful R&B selections to seduce your senses, provoke your thoughts and take you to ecstacy. This show also comprises of a little chit chat surrounding various hot & steamy relationship topics from our different vantage points. 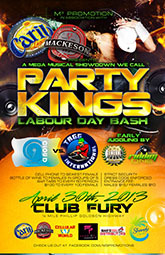 The weekend is officially here and TAGG International brings it in House Party style. Link up to get the official word for what's going down for the weekend. No matter how you look at it, Stone Jam is DJ royalty and every Friday afternoon the Stone Jam Family rules the radio and internet with Jaro and the Mad Ras flinging dub after dub, new tune after new tune and serving notice that Stone Jam still run things! Stone Jam Family and CRUFFYcast to the world! It's the 1st Lady of CRUFFYcast's turn to show the fellows wassup! Jackie Cas with a little help from DJ Jago of TAGG International is in charge of this energy soaked session of pure musical madness! Saturday mornings is pure madness LIVE on CRUFFYcast! Jah Fire Sound, the mad sick, head nuh good again crew featuring Kenny G and Riddim rips it up every Saturday afternoon from start to finish. It's pure musical insanity with as well as some comedy relief from these two when they hijack CRUFFYcast every Saturday afternoon with nothing but bad intentions! RIP DJ Cue: Gone But Never Forgotten! Text your requests to 10 - 10 - 202 and be sure to mention you're in tune via CRUFFYcast.com! As well, please leave us a little shout out in our guestbook and let us know how you feel about our site and its service.